This set of 75 Building Blocks will keep your children entertained building houses, towers and cities for hours. Building Blocks are a fantastic and fun way to develop children's education Physically, Socially, Intellectually, and Creatively. 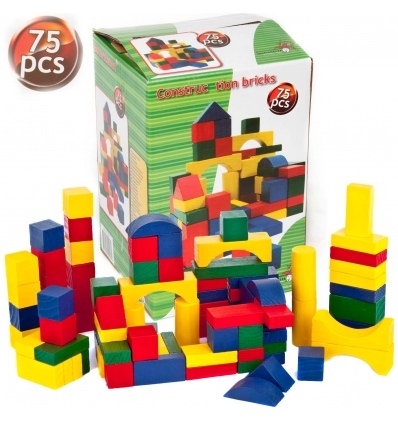 Physical benefits: toy blocks build strength in a child’s fingers and hands, and improve eye-hand coordination. They also help educate children in different shapes. Social benefits: block play encourages children to make friends and cooperate, and is often one of the first experiences a child has playing with others. Blocks are a benefit for the children because they encourage interaction and imagination. Creativity can be a combined action that is important for social play. Intellectual benefits: children can potentially develop their vocabularies as they learn to describe sizes, shapes, and positions. Math skills are developed through the process of grouping, adding, and subtracting, particularly with standardized blocks, such as unit blocks. Experiences with gravity, balance, and geometry learned from toy blocks also provide intellectual stimulation. Creative benefits: children receive creative stimulation by making their own designs with blocks.